What is the PROPER Function? PROPER function is categorized under Text functionsFunctionsList of the most important Excel functions for financial analysts. This cheat sheet covers 100s of functions that are critical to know as an Excel analyst. 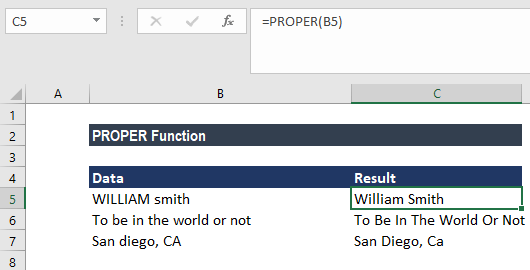 PROPER will capitalize the first letter in a text string and any other letters in text that follow any character other than a letter. In financial analysis, we often import data from external sources. 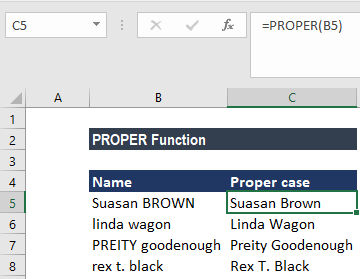 The PROPER function will help us convert text into proper case if required. We can use it to capitalize each word in a given string. Using the function will not affect numbers and punctuations. It will convert all other letters to lowercase. Text is required argument. Text needs to be enclosed in quotation marks, a formula that returns text, or a reference to a cell containing the text you want to partially capitalize. 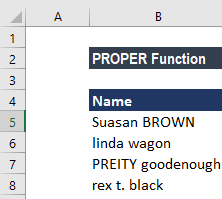 How to use the PROPER Function in Excel? 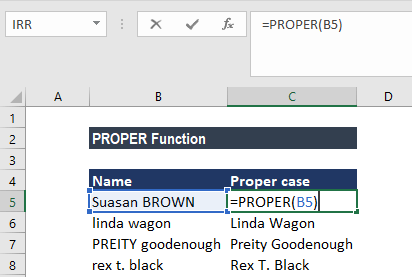 Suppose we wish to clean up names that are not in a proper case, we can use a simple formula based on the PROPER function. The PROPER function will automatically reformat the text so that all words are capitalized. At the same time, it will convert to lowercase all other text. If we also need to strip out extra spaces in the names, we can wrap PROPER in the TRIM function: =TRIM(PROPER(name). TRIM will remove any leading and trailing spaces, and convert runs of spaces into a single space. The first letter of every word, letters following numbers, or other punctuation are converted to uppercase by the PROPER function. It may be in places that we may not expect. For example, the function converts the “s” in the text string “Bob’s Boat” to uppercase (i.e. “Bob’S Boat”).